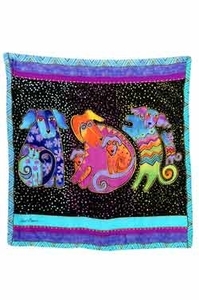 Laurel Burch shows that dogs can be as cute as cats in this Dogs and Doggies scarf. This is a silk scarf with original artwork authentically created by Laurel Burch. Unbelievably soft, high quality silk and vivid, colorful Lauren Burch design makes this a perfect gift. Laurel Burch scarves have hand-rolled hems. Silk scarf is approximately 34.5" long by 34.5" wide.